A stock drop is never reassuring  except when it could have been worse. 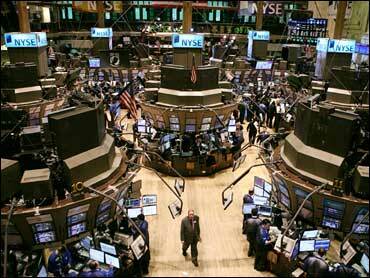 The Dow Jones industrial average shed 115 points, or 1.5 percent on Tuesday. But it also held onto 382 of the 498 points it racked up a day earlier. Anyone with a 401(k) would have liked to see the rally continue. Market analysts said, though, that a pullback was expected given the massive gains Wall Street logged the day before when the government released plans lift bad loans off banks' books. "We'll take that trading pattern any time," said Arthur Hogan, chief market analyst at Jefferies & Co. He said he came into work anticipating the Dow to drop between 1 percent and 2 percent Tuesday after the index jumped 6.8 percent Monday  its biggest gain since late October. If Wall Street gets more good news, stocks could resume their rise. But if it doesn't, the rest of Monday's rally, and then some, could be wiped out. Investors have been cautious, recalling the 20 percent rise between late November and January that fizzled, with stocks then tumbling to new lows on fears about the economy and banking system. Thomas J. Lee, a stock market analyst at JPMorgan, said the market's ability to hang on to most of its rally was encouraging. But, he added, "This has definitely been a show-me market." According to preliminary calculations, the Dow fell 115.65, or 1.5 percent, to 7,660.21. The index fell in early trading, rose briefly in afternoon trading, and then turned lower again. Broader stock indicators also tumbled. The Standard & Poor's 500 index fell 16.90 points, or 2.1 percent, to 806.02, and the Nasdaq fell 37.47 points, or 2.5 percent, to 1,516.30. Before the market's retrenchment Tuesday, stocks had spiked about 20 percent over the course of 10 days on actions out of Washington and nascent signs of economic renewal. Recent reports on retail sales, housing starts and inflation have all topped traders' bleak expectations. Last week, the Fed said it would buy long-term government debt to help drive down interest rates for home loans and credit cards. And the government sparked new hopes for further improvement Monday after it detailed plans for a mix of taxpayer and private money to help banks get rid of up to $1 trillion in bad loans from their books. The bulk of Tuesday's market retreat was in financial stocks  the companies that have been rising the most recently. It also won't be easy to wean the economy from a diet of excessive debt. Some businesses and consumers are struggling to pay down what they owe. They're cutting spending, which is hurting other parts of the economy. Phil Orlando, chief equity market strategist at Federated Investors in New York, said many traders are pleased by the government's plan to help banks but said that signs of an improving economy will be needed for the market to hold its gains. He said nagging worries about big problems like unemployment could shake investors. "We are treating this cautiously as we recognize that there are still some storm clouds on the horizon," Orlando said. The Russell 2000 index of smaller companies fell 16.97, or 3.9 percent, to 416.75. Bond prices were mixed. The yield on the benchmark 10-year Treasury note, which moves opposite its price, rose to 2.70 percent from 2.68 percent late Monday. Overseas, Britain's FTSE 100 fell 1 percent, Germany's DAX index rose 0.3 percent, and France's CAC-40 rose 0.2 percent. Japan's Nikkei stock average rose 3.3 percent.